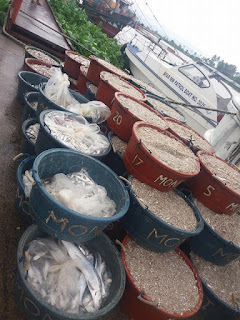 Tubs of fish were confiscated by the authorities after the apprehension of two commercial fishing vessels. BULA, Camarines Sur -- Joint operations of the Bureau of Fisheries and Aquatic Resources and Philippine Coast Guard on July 17, 2018 resulted to the apprehension of two commercial fishing vessels, FB Rosie Moneth and FB Reyanna. According to BFAR, the vessels were in violation of the amended Fisheries Law (RA 10654) specifically, Section 86 (Unathorized Fishing), Section 93 (Use of Fine Mesh Net), Section 113 (Commercial Fishing Vessel Operators Employing Unlicensed Fisherfolk, Fishworker or Crew), Section 121 (Use of Unlicensed Gear) and Section 128 (Other Violations) in relation to Fisheries Administrative Order No. 198 (Rules and Regulations on Commercial Fishing). The vessels were intercepted after its fishing operations in the municipal waters of Calabanga, Camarines Sur within the San Miguel Bay. Confiscated were 49 tubs assorted fish, mostly anchovies, with estimated total valuation of P9,800.00. These will be distributed to charitable or penal institutions nearest the apprehension site. Corresponding administrative and criminal charges will be filed against the owners, three highest officers and other offenders. The joint operation is in line with the swift order of the Undersecretary for Fisheries/BFAR Director Eduardo B. Gongona to end illegal, unreported and unregulated fishing and to eradicate hulbot-hulbot and other destructive fishing methods in the country. BFAR Bicol Regional Director Dennis del Socorro emphasized the need to fully understand why fishery violations are happening and why it is necessary to raise the level of awareness on socio-cultural sensitivities. Del Socorro further cited that there must now be an integrated and multi-sectoral law enforcement approach to have an effective implementation of the fisheries law, rules and regulations. BFAR will continue to conduct “soft-approaches” such as social marketing and mobilizations, information and education campaigns and community-based resource management and “hard-approaches” in fishery law enforcement such as visibility and covert patrolling, deceptive tactics, market denial and inspections and multi-agency collaborations.